Welcome to Russia! Andrew and stepson Arseniy Smirnov emerge upon a Moscow street illuminated from above by string lights. Just a few years back this street was clogged with traffic. So much better! Train to Ivanovo, just a couple hours from Palekh were we are going. Palekh is one of the four village famous for doing Russian lacquer miniatures. A few views of Palekh itself. And bridge to cross it. Main church in center of Palekh. Different view of same church at dusk. Art school in Palekh where students learn the art of painting miniatures. Old factory in center of Palekh where as many as 200 artists would paint lacquer boxes in Soviet time. Construction of what was supposed to be the new factory for artists. Financial problems put a skidding halt to construction, though, and nothing has changed here in more than 20 years. The majority of artists, like this one, work at home now. Back walking the town. You will see a lot of houses with rather ornate borders called "Nalichniki" or platbands in english. Was lucky enough to be in Palekh for Victory Day, May 9th, where the were festivities going on downtown, including a parade, singers, and people carrying around pictures of relatives lost in WWII. Monument in Palekh with names of town residents who died in the war. There is another monument like this with equally as many names. Palekh is not that large. This gives an indication of just how many lives were tragically lost in that country. Inside new Palekh museum. Very nice! Museum display shows the founders of the new art form in Palekh in the early 20th century - Russian lacquer miniatures. House of Ivan Golikov, perhaps the most famous of the founders. Apartment building where several artists live, including Vera Smirnova. Vera holding one of her new pieces, still in progress. Vera with Ekaterina Bykova, another Palekh artist. Look for a sensational work from her coming on our website in a few months! . Talking with Vasily Makashov at his house (he did the icons behind him). Vasily is the Head of the Palekh Department of the Union of Artists. With another artist, Galina Mochalina and husband. We will be having a small showing from her on the web in the next month wtth some great traditional pieces. Chickens and rooster, not an uncommon sight. Also took day trip to Kholui, not very far from Palekh at all. Water rises from this river in the spring and there are few weeks you can't even get here by car. 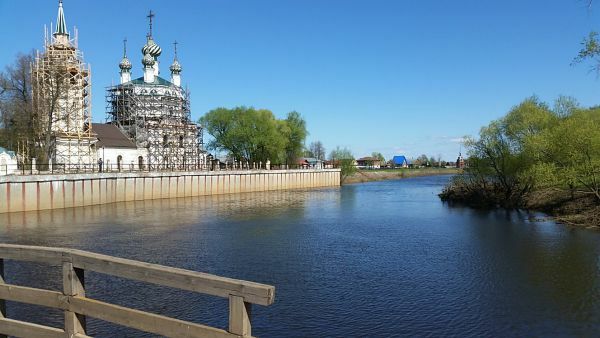 Alexander Nevsky Chapel along river in Kholui. Museum in Kholui dedicated to miniature art form. Church in Shui, another town not too far from Palekh. Supermarket in Shui. Gone forever are the days when only a few apples could be found on the shelves. This supermarket as good as most in the US. Back in Moscow now and an area that looks a little like Disney's magical kingdom, except this one had smallish museums inside. Like this one: the Vodka History Museum. Meanwhile, a gigantic Matryoshka doll stands nearby. Near Kremlin Palace, waiting to attend ballet. "La Esmeralda" is the performance tonight and it is gorgeous! No photography allowed....but sometimes you just have to break the rules. Vera at station in Moscow which had dozens of back lit glass signs with images from a dozen or more ancient towns, including the famed Golden Ring. This one says "Palekh". Goodbye for now!